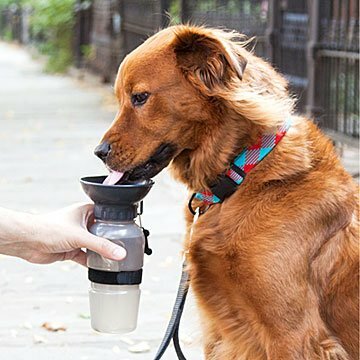 This water bottle keeps your canine companion well hydrated on the go. Running, fetching, and showering your human with love can be thirsty work. Designed just for dogs, this water bottle keeps your canine companion well hydrated on the go. With just a squeeze of the bottle, the attached dish fills with water at an inviting height for dogs to drink. This patented design is leak-proof and excess water drains back into the bottle to minimize waste. The adjustable velcro strap lets you attach the bottle to a backpack, belt, or wrist. Fits any standard car cup holder for easy one-handed access when driving. Food safe and BPA free. Made by Gary Ross in Ventura Valley, California. Gary Ross is a California-born surfer, designer, and inventor living in Ventura County, California with his wife and product test poodle, Bongo. Gary finds most of his inspiration through surfing, a passion in the family that roots back to 1920s Santa Monica, where his Uncle Bud was one of the first California surfers. He uses this inspiration to create simple tools to solve everyday problems. When Gary isn't doing that, you'll find him working on his artificial surf reef models and designing ways to harvest energy from our oceans. Bought for family members with dogs and they love it. Convenient way to ensure they have water available for their fur babies whenever and wherever. I love how convenient it is while in the car but not so much while hiking. I have to hold it upright the hole time or empty the bottle. Bought this for my sister who has a Bullmastiff puppy. When I brought it over to her, the puppy was already trying to drink from it! Perfect for long walks, running errands with your dog. I love this and so does my husky! Bowie, my dog, loves to drink out of this and I love that water doesn't get wasted and it also does NOT leak! This was a gift for someone that takes long homes and walks with their dog. Now they will both be hydrated. Great design with bowl top and water goes back in. No wasting water. Can be worn around waist. I looked like a genius! Bought this item for my son and granddog who live across the country. They were very pleased with this item. I have two 45 pound dogs and took a 10 hour car trip. This bottle was super convenient and I didn't have water spilled all over the car. Both dogs drank from it without hesitation.